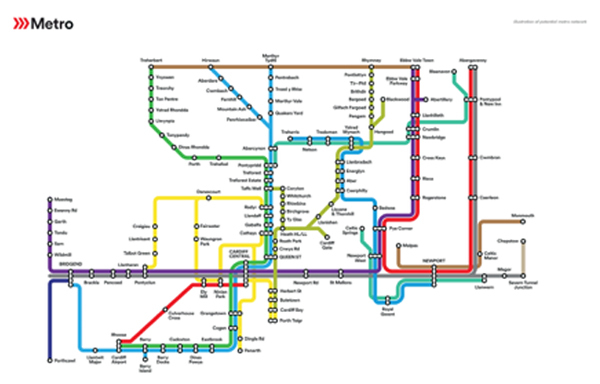 A pivotal factor in the economic policy picture of South East Wales is the Welsh Government’s plan for a Metro for the Cardiff Capitol Region. Regenerative – transit oriented development across the region. It will link together the 10 local authority areas of the Cardiff Capital Region addressing the major constraints currently on the rail network; key strategic development sites; and population centre that that are poorly served by rail at the moment. Metro is a long-term programme that is being developed so that it can be incrementally extended. Phase 1 is in progress. The extension to Ebbw Vale town and further capacity enhancement on that line, as well as other station enhancements across the network, are already complete or in progress. Metro Phase 2 (2017-2023) will focus on modernising the core Valley Lines and the wider South Wales rail network. This infrastructure work will be integrated with the programme to procure the next Wales and Borders franchise. This will result in a network that enables high-quality and reliable services which can deliver four vehicles per hour across the entire network when needed, with reduced journey times, and the capacity for additional stations and network extensions. If Phase 2 contains some form of light rail, then a range of rail based extensions will be easier to accommodate. This could form the basis of a long term incremental programme of expansion beyond 2023. Support the creation of 7,000 jobs. Over 30 years contribute an additional £4Bn to the regional economy. Deliver a one-off construction impact from Metro and contingent developments of £4Bn. Increasing the catchment of the regional transport network by 420,000 or 60%. Reducing average door to door journey times across the region. For more information, news and developments please visit the Welsh Government Metro pages.